Whilst on holiday in South Korea I went on a tour of Panmunjom and the demilitarised zone by the border of North and South Korea. There are lots of agencies running similar tours, and there are differences in what places you see on each tour. I booked about a month in advance via email for the ‘DMZ & Panmunjom’ tour run by the Panmunjom Travel Centre. They run several different tours, the one I went on was known as the ‘combined’ tour as it visited the DMZ and Panmunjom. The day started shortly after 8am by registering at the Lotte Hotel in Seoul. The tour cost 120,000 Won (about £65) which I paid on the day, and after they checked my passport I was given direction to find the bus. About 80% of the people in the bus were Japanese, and they’d separated the English speakers out and put us at the back of the bus so we could get English commentary. As the bus rode northwards the tour guide gave us some background on the Korean war and how the DMZ was created. 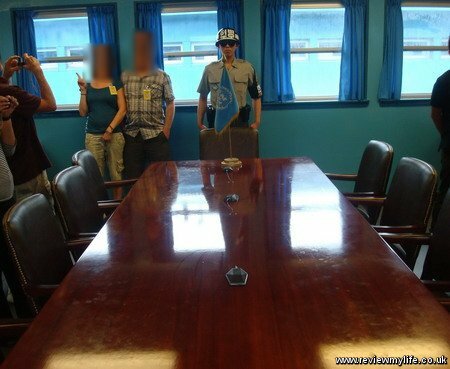 She also explained about the security procedures that would take place once we reached the DMZ. On the bus was a lady who had defected from North Korea and we got to ask her questions before we reached the DMZ (she wasn’t allowed in this area). When we reached Camp Bonifas (named after a soldier who was killed by the North Koreans in 1976) a South Korean soldier came onto the bus to accompany us for the tour. He checked our passports and also had a look at what we were wearing. One of the other English speakers (an American) was singled out because he was wearing a t-shirt with an American theme. The tour guide explained that the soldier wasn’t happy about this. North Koreans don’t like Americans, so wearing this t-shirt would draw attention to him. Luckily they carry some spare clothes on the bus for people who are wearing the wrong kind of clothing. He was given an ill-fitting shirt which he had to wear whilst in the areas that would be in sight of the North Korean guards. We drove through the DMZ and saw soldiers on the way, most of them lightly armed with just hand guns. When the bus reached the Joint Security Area (JSA) in the village of Panmunjom we got off and went into the Freedom House to watch a video about the history of the area. 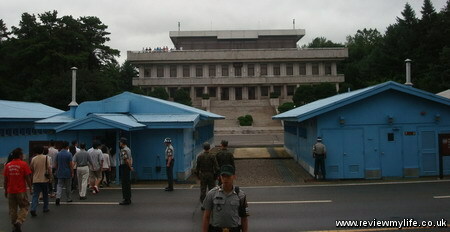 Next we were allowed to walk to the front of the Freedom house from where we could see the North Korean side of the JSA. If you look at the top left of the photo towards the North Korean side, on top of their Panmungak building you will see another group of tourists. They are in North Korea and are on the North Korean version of the JSA tour. Neither we nor they are allowed to cross the border. They were waving and shouting at us, but we had been given instructions not to make any guestures, or say anything over the border. 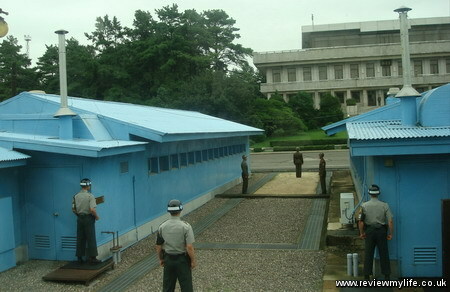 The blue ‘sheds’ straddle the border, and there is a small concrete block inbetween them which marks the border position. We were allowed to go inside the one on the left which is the MAC Conference Room where both sides can meet. Inside the conference room we were allowed to walk its full length crossing the line that marks the border. The border goes through the middle of the conference table. We were allowed to have our photo taken with the UN soldier who is in his ‘taekwondo pose’ but we were under strict instruction not to touch him – one lady got told off for trying to touch his arm while posing for a photo! Back outside in the JSA we could see a North Korean soldier watching us through binoculars – they still wear old Soviet style uniforms. The UN soldiers and South Korean soldiers look quite distinctive. The UN soldiers look muscely, wear sun glasses and stand in motionless taekwondo poses. 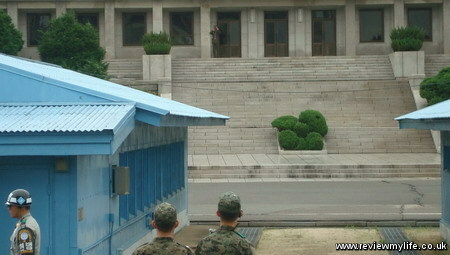 The South Korean solders are thinner, wear softer uniforms and casually walk around, many of them are young conscripts. This below shot shows the classic poses of the two sides. On our side two UN soldiers have positioned themselves so they are half covered by the conference rooms. This is to give them cover, and also to allow them to signal back to our side without being seen by the North Koreans. On the North Korean side two soldiers face each other, the idea being that if either of them tries to cross the border (a mere foot away from where they are standing) they other will shoot him. The North Korean soldier who is facing away from the camera is there to try to make sure no one else from North Korea tries to defect. We got back on another bus (a so called military bus – but it was just a bus, nothing unusual), and were acomponied by both our South Korean soldier and another military vehicle as we drove around some of the other sights in the JSA including the ‘Bridge of no return’. 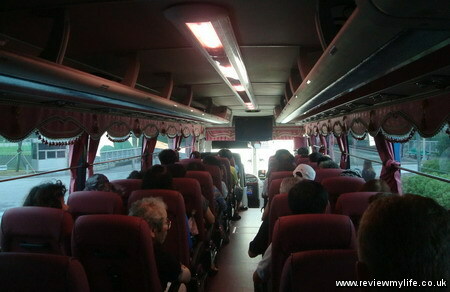 The bus then drove to the ‘Imjingak Tourist Resort’. 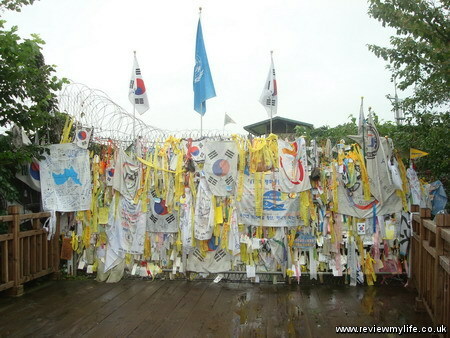 There are a selection of sights here such as a peace bell, memorial altar and this ‘freedom bridge’. We had lunch at a large Korean restaurant that seemed set up to receive coach groups. I’d requested a vegetarian meal in advance and so had a tasty vegetarian bibimbap. After lunch we went to the Dora Observatory from where you can see the village of Kijŏng-dong, which the South Koreans call ‘the North Korean propaganda village’. The North Korean flag may only be a few pixels wide (towards the upper right) in my photo but it is huge and weighs 270kg. They have a rule here that you can only take photos behind the yellow line. The only way to get a decent photo is to hold the camera above your head and keep taking pictures until you get a good one. 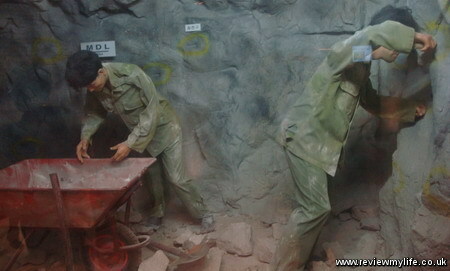 Next we went to the ‘3rd Infiltration Tunnel’, the 3rd such tunnel that the South Koreans had discovered. The North Koreans have dug many such tunnels over the years across the border. The tunnels were dug by hand and dynamite. You can take a small train down into the tunnel to have a look. No cameras are allowed in the tunnel so I only have a photo of the train. The actual tunnels are cramped and very roughly cut from where the rock has been dynamited. 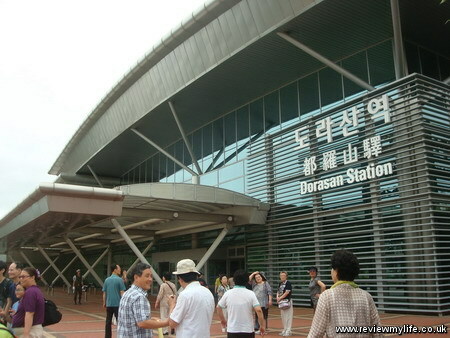 Our final destination before heading back was Dorasan Station. This station was built to connect North and South Korea but was only used briefly before the North Koreans closed the border. Now it is just a touist attraction. 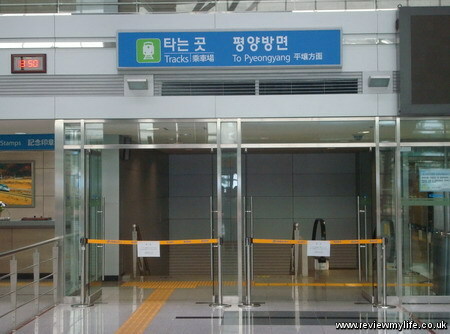 You can buy a platform ticket to go through the doors to Pyeongyang and walk on the platform. 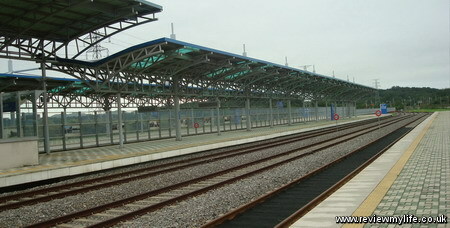 This is the very quiet platform of Dorasan Station looking in the direction that trains to North Korea would travel. After having seen the station we got on the bus for the final time back to the Lotte Hotel in Seoul. Overall the trip is well worth going on. It is expensive, but it isn’t possible to see all these sights unless you go with an organised tour. Before booking a tour make sure it visits the places you want to see as not all of them go to the same areas. This page is about Japan re-entry permits and the embarkation / disembarkation cards that you have to fill in when you enter and leave the country. Both are closely linked together so I’ve put this information in one larger post, rather than two smaller ones. 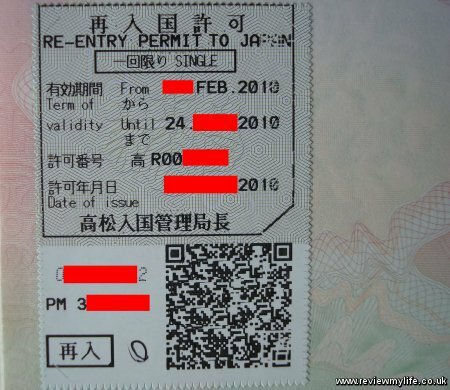 If you have a visa (residence status) to be in Japan and wish to make a temporary trip out of Japan you will need to get a re-entry permit in order to re-enter the country without losing your residence status. If you leave Japan without a re-entry permit then your residence status/period of stay gets automatically cancelled so it is very important to make sure you remember to get your permit. Note: Re-entry permits only apply if you have a visa for Japan. It does not apply if you are in the country on a visa waiver scheme and have a temporary visitor landing permit. If you have a temporary permit you can just leave the country and when you come back you will get a new temporary permit (as long as immigration let you in that is!). To get a re-entry permit requires a simple visit to your local immigration office. You can find the official application details and a copy of the application form on the immigration website. I went to the Takamatsu immigration office where I first had to sign in at the door. Then I went to the 2nd floor to buy a revenue stamp. If you want a single re-entry permit it will cost you ¥3000, or if you want a multiple re-entry permit it will cost ¥6000. I bought a stamp for a single re-entry permit. 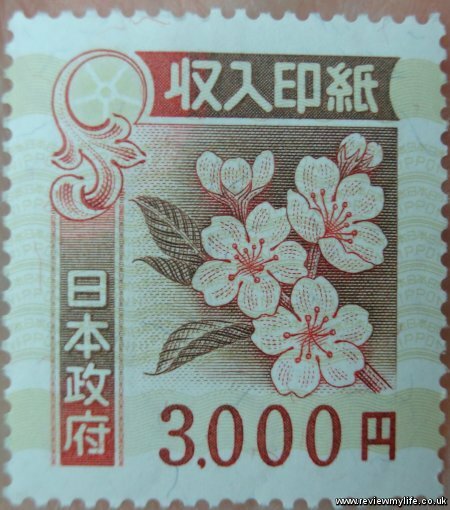 In Japan they have this system of paying for revenue stamps in a different location to making the application so that no money changes hands when the application is made – this is to stop bribery attempts. The same revenue stamp system applies if you get a Japanese driving licence. I then went to the 8th floor where the immigration application office is. In there I collected the application form and started filling it in. A man who spoke very limited English gave me a bit of help. I then handed it in along with my alien registration card and passport. The questions on this form are asked from the point of view of your stay in Japan, which may not be clear from the English translation. ‘Period of Stay’, means how long your period of stay in Japan is (e.g. 1 year), not how long you are going to leave Japan for. ‘Purpose of travel’ question is referring to the purpose of travelling out of Japan, not your purpose for being in Japan. You don’t have to worry about being exact on the expected date of departure and re-entry. They just want a rough idea, it won’t cause you problems with immigration if you change your mind later. ‘Expected destinations’ is where you are planning on travelling outside of Japan. Leave occupation blank if you have no job, and the name in chineese characters can also be left blank unless you have a Kanji version of your name. If you are in the country on a working holiday visa the status of residence is ‘designated activities’. I had to sign this application form, and also the form onto which the revenue stamp was stuck. I then had a five minute wait while they processed the application, they then gave me my passport and foreigner card back. My passport now had a re-entry permit stuck in it. 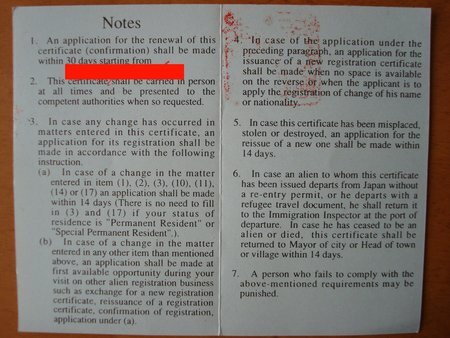 The expiration date of the re-entry permit is the expiry date of your current period of stay, or a maximum of three years from today (whichever is earliest). They also gave me a new embarkation/disembarkation card to use for my trip out of Japan. You’ll need a new one of these cards for each trip out of Japan – you can pick them up at the airport at immigration if you lose yours, or need a new one. If you change/extend your residence status then any re-entry permit that you already have will be invalidated. Therefore you will need a new one if you want to make a trip out of Japan. Most of you probably won’t be going to the Takamatsu immigration office, more likely you’ll go to the Tokyo one. Here are a few differences. At the Tokyo office (the one near Shinagawa on the port island) you don’t have to sign in. You buy the revenue stamps from the Family Mart on the 1st floor (or ground floor – if you aren’t used to the Japanese floor numbering system). The re-entry stamp counter is on the 2nd floor, and after handing in the application you’ll be given a numbered ticket so you know when to come up and collect your passport. When you first arrive in Japan you will have to fill in an embarkation / disembarkation card for foreigners. It looks like this and will probably be given to you on the plane. If you don’t get given it on the plane you can pick it up before going through the immigration counter in Japan. It is in two parts. The disembarkation part is on the right, and the embarkation part is on the left separated by some perforations. The disembarkation part refers to your arrival in Japan. The embarkation part is for when you leave Japan for the last time on your current visa or temporary permit. If you are a tourist you will only ever deal with this type of embarkation / disembarkation card. 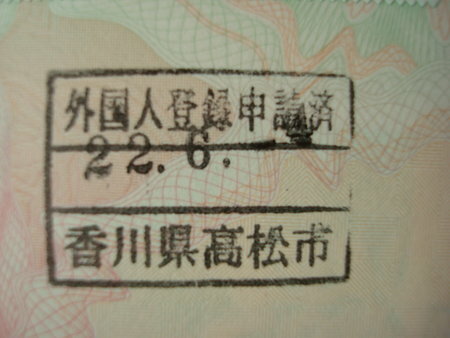 Before going through immigration on arrival in Japan you must fully fill in the right side of the card. You can also fill in most of the details on the left side (but leave the flight number blank until you know for sure which flight you are leaving Japan on). The immigration inspector will detach the right side of the card (the disembarkation part) and will staple the left side into your passport – probably on the same page as your landing permit that states how long you may remain in Japan. Then when you come to leave Japan the immigration inspector will remove the embarkation part of the card from your passport – which must at that point be fully filled in with your departure flight number. If you leave Japan with a re-entry permit then you will also be filling in this card. You may note that the embarkation and disembarkation parts are the opposite way round. When leaving Japan with a re-entry permit the immigration inspector takes the right side of this card (the embarkation bit) and staples the disembarkation part into your passport. When you re-enter Japan he takes the left side (the disembarkation part). When you leave and re-enter Japan on a re-entry permit the embarkation part of your original embarkation / disembarkation card for foreigners is not touched. It remains stapled into your passport. –> Enter Japan – disembarkation card for foreigners taken. Embarkation card for foreigners stapled in passport. <-- Leave Japan – embarkation card for foreigners taken. <- Leave Japan temporarily – embarkation card for re-entrant taken. Disembarkation card for re-entrant stapled in passport. -> Return to Japan – disembarkation card for re-entrant taken. <-- Leave Japan (cancelling visa/residence) – embarkation card for foreigners taken. <-- Leave Japan (cancelling visa/residence) – embarkation card for foreigners taken. If you haven’t picked up the pattern, the disembarkation part of the card is always taken by immigration when you arrive in Japan, and the embarkation part is always taken when you leave Japan. 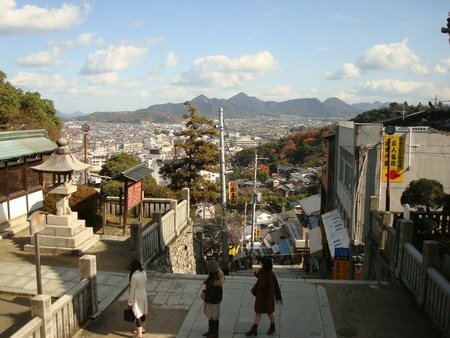 The Kotohira Shrine in Kagawa on Shikoku Island is famous for its steps. Its 1368 steps! It isn’t as bad as it sounds though, and if you are visiting Takamatsu and have seen the obvious sites (Ritsurin Park, Tamamo Castle), then consider going to the Kotohira Shrine (also known as Konpira-San) next. 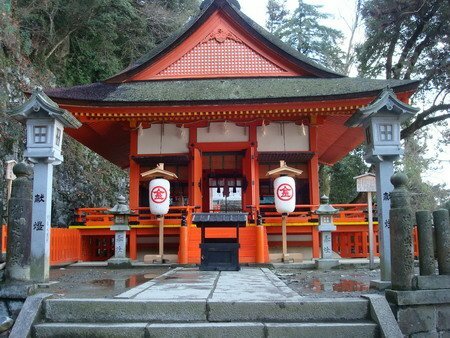 It is one of Japan’s most famous Shinto shrines. Get the Kotoden train (the right one!) from Kawaramachi station in Takamatsu’s Tenmaya department store and go to the end of the line. Outside the station you’ll see this imposing wood and stone building. Head towards the mountain and you’ll find the beginning of the steps. At this early stage of the climb there are loads of shops and food places on either side. 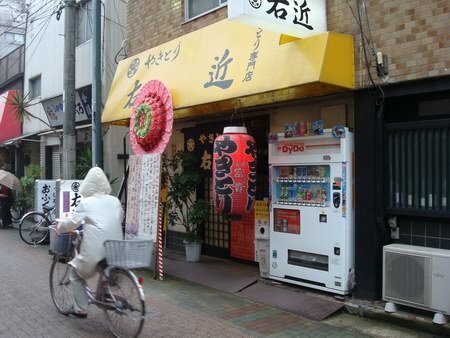 You can buy snacks, udon, ice cream, and even imitation samurai swords and air pistols! Many people will buy a stick from here to help them with the climb. 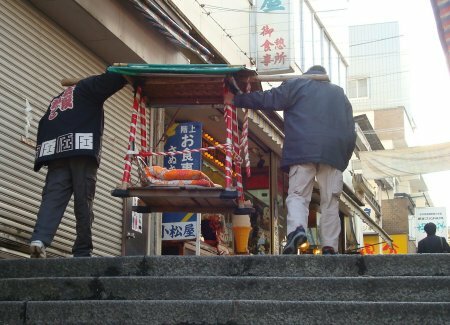 You can pay (for a hefty price) to be carried up the steps by two tired looking locals on a chair. Don’t let the step count intimidate you though – it isn’t that bad. There were plenty of elderly people, and children making their way up when I was there. There are loads of areas to stop off on the way so you can take lots of breaks. Just don’t try it on a really hot day – you’ll suffer! As you go up there are a variety of statues, shrines, and other buildings for you to look at. Part way up and the view is starting to look good. Through a torri gate, and towards another flight of steps. There are some interesting items to look at. 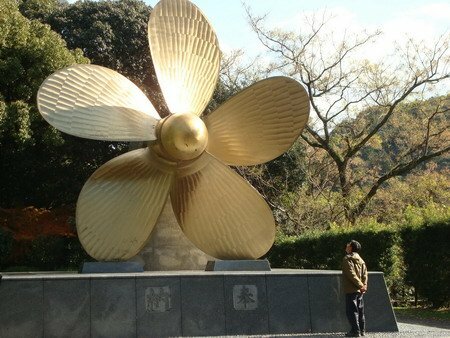 Including a large gold coloured propeller. And a wood covered area housing some kind of boat, and a man performing some kind of ceremony. More steps – can’t be long to go now. And finally – the highest point you can go. Here’s the view from near the top of the stairs. And then of course I have to go back down the steps. There are a lot of steps, but all the interesting stops on the way up, and the views take your mind off it. If elderly people and school children can manage it, then as long as you have a basic level of fitness you should have no trouble. Megijima Island is a small island visible from the Sunport harbour area of Takamatsu. 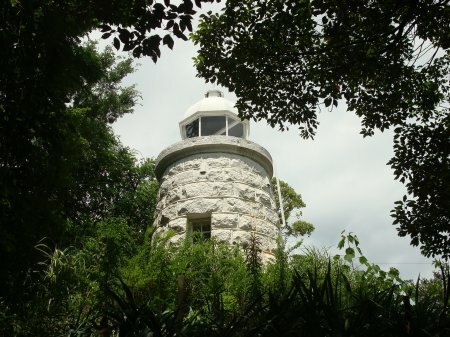 It is just 4km away, has an area of 2.66km and a population of about 200 people. The island is also known as ‘Monster’s Island’ or ‘Devil’s Island’! 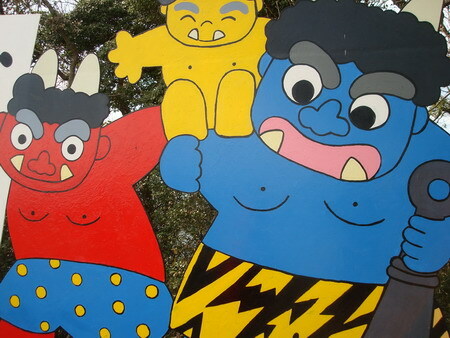 There is a legend that the mythical character Momotaro made an appearance on the island many years ago. 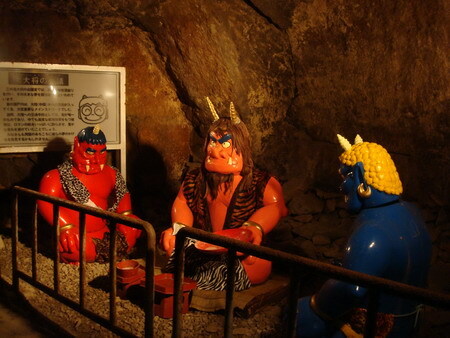 This conveniently has allowed the people of Megijima to create a monster themed tourist attraction in its caves! To get there you’ll need to take the ferry from Takamatsu harbour. The ferry is every hour or two from 8am until 19:15pm and takes just 20 minutes to get there. Once on Megijima it became clear that we hadn’t done our research because we didn’t have a clue where to go, and there were no signs in English. But somehow we ended up paying money to a man, and got into his people carrier car with another Japanese family. He was going to take us up to the caves and back. We drove up the hill, and when we reached the caves had to buy entry tickets from a ticket machine there. The man then took us all into the caves. 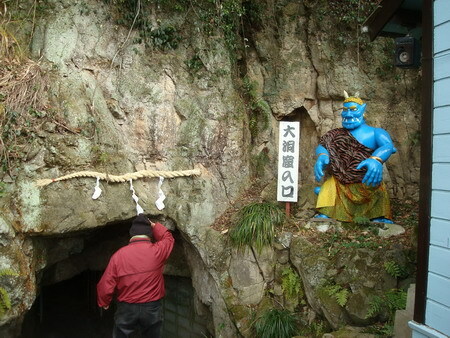 He proceeded to give us a tour of the caves – all in Japanese. The Japanese family were able to understand it, but we weren’t. I’m sure he was explaining about the legend and the monsters. 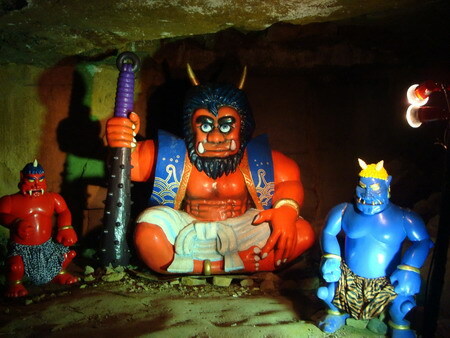 Inside the cave are many plastic model monsters in various poses. Some of them I recognised from elsewhere around Kagawa. In total I think we spent about 15-20 minutes in the caves taking photos of the monsters. Once out he took us on a short walk up to Washigamine Summit which has a 360 degree viewing platform. From there you can see the Seto Inland Sea, Takamatsu, and many of the other Seto Sea islands. He then drove us back down the hill, and we stopped off at the coast, where we could get another view of the Seto Inland sea. We could also see the next boat which we were hoping to get! Just in time we all got back inside the car and he drove us back to the port. If it had been a warmer day we could have spent a few hours walking around the island (the coastline is only 8.9km). 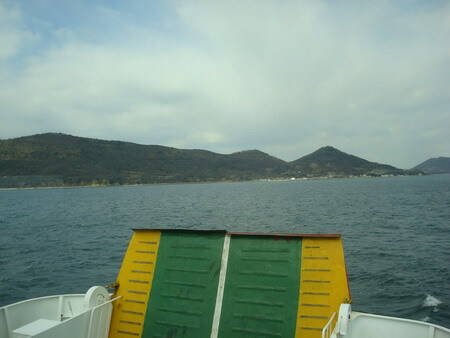 But it was cold, so we got onto this ferry and headed back to Takamatsu. From Megijima there are ferries going to both Takamatsu and Ogijima so make sure you get the right one. 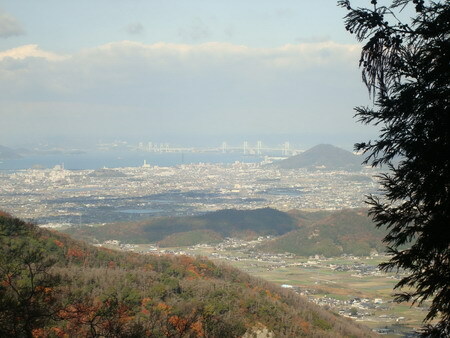 To the East of the Takamatsu Sunport area is the Yashima 屋島 flat top mountain. You can’t miss it as it is visible for miles around and is distinctive in shape. You can get there by Kotoden train from Kawaramachi station. Just outside the Kotoden Yashima station you can get a shuttle bus to the top. On the plateau you’ll find an aquarium and a temple, as well as a number of abandoned hotels. 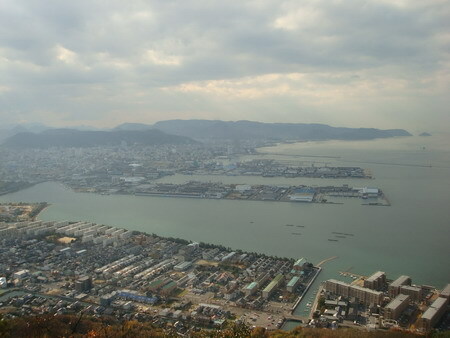 You’ll also get a great view across Takamatsu and the Seto Inland Sea from the plateau which is 293m above sea level. 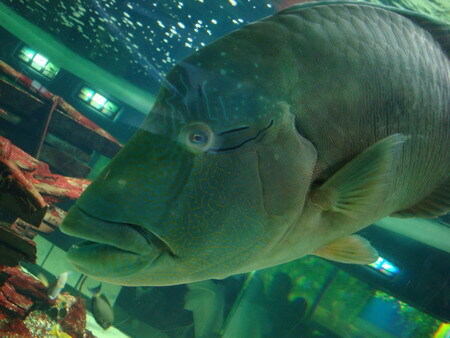 First I went to the Yashima aquarium (or the ‘New Yashima Aquarium’ as they are calling it. They claim it is home to 300 types of fish. 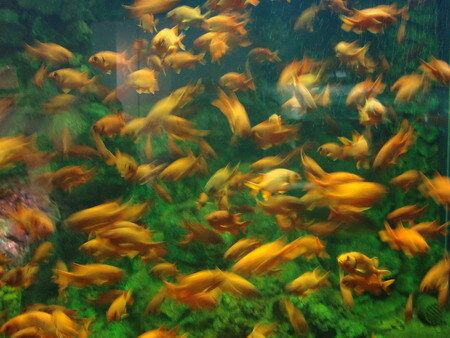 There are many tanks of multi-coloured fish and other sea creatures. As well as the static fish tanks they have a dolphin show, and a sea lion show. You can spend quite a few hours here looking at the fish, and watching the shows. 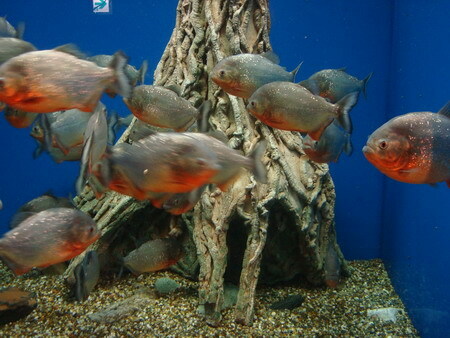 Children especially will appreciate the aquarium if they are getting fed up with all the cultural sites in the area! Very close to the aquarium on the top of Yashima is the Yashimaji Temple. 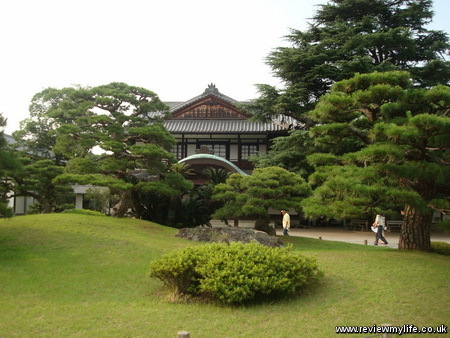 This is one of the 88 temples in the Shikoku Island 88 temple pilgrimage. You can spend 10-15 minutes here looking around. 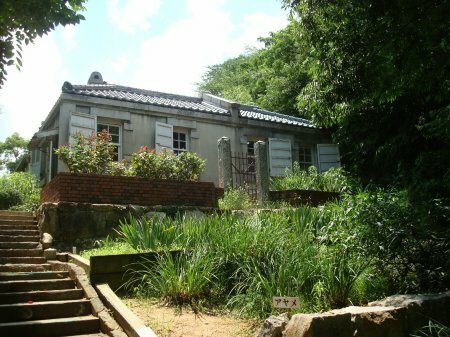 If you are making a visit to Yashima you might also want to visit the Shikoku-Mura museum which is at the foot of the mountain. Click the link to read my review of it. 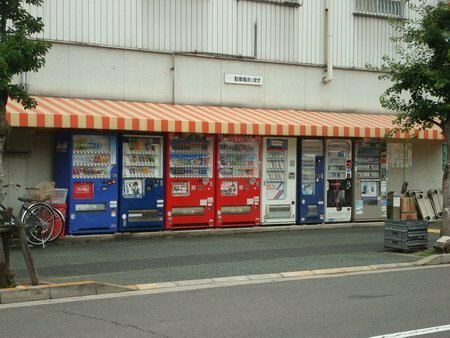 Japan is full of vending machines. There are everywhere from city centres, to deserted alleys. 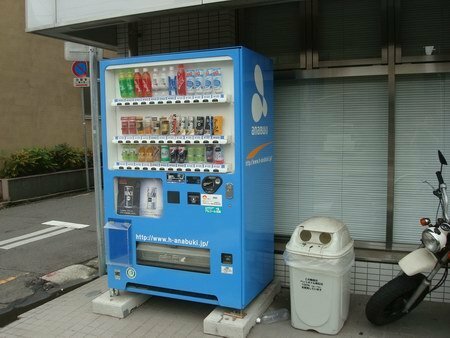 Anywhere where there is a power supply can be home to a vending machine. 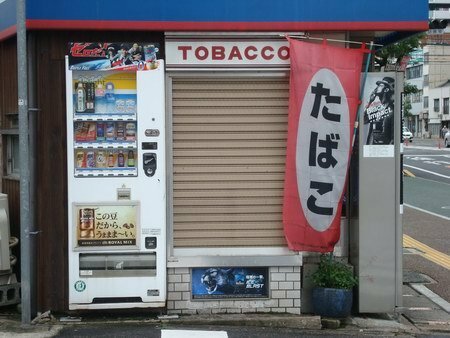 Here is a collection of photos of vending machines that I have taken, they are mostly taken around Takamatsu in Kagawa, on Shikoku Island. 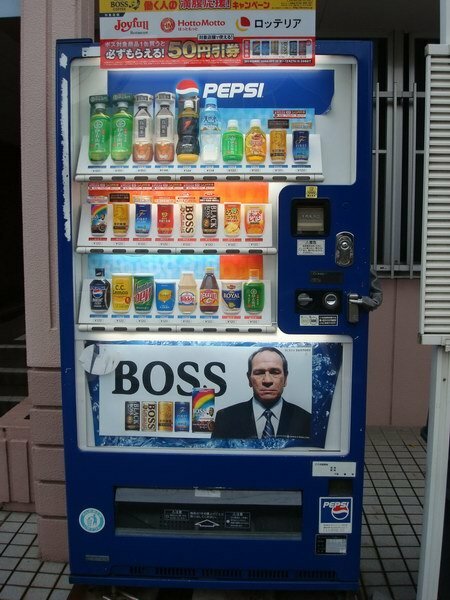 Although there are vending machines that dispense all kinds of weird stuff, most of them just dispense drinks. On the machine above the blue buttons dispense cold drinks, and the red buttons dispense hot drinks. Yes the photo is a grumpy looking Tommy Lee Jones, whose photo was all over these machines during 2009 and the first half of 2010. Often you’ll get big rows of these machines all together. And sometimes the vending machines will be all alone. 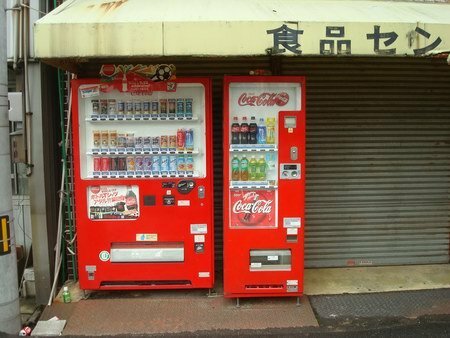 Here are two Coke machines side by side. One serving cans, and the other bottles. The one on the below right is specific to Takamatsu. You can use your Kotoden Iruca travel card to buy the drinks. 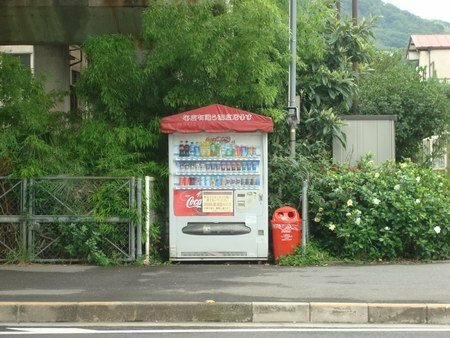 Anywhere there is a small piece of space you can find a vending machine. Below they’ve used a bit of spare ground next to a single car parking space. And on the right, they’ve fitted one between two pillars. 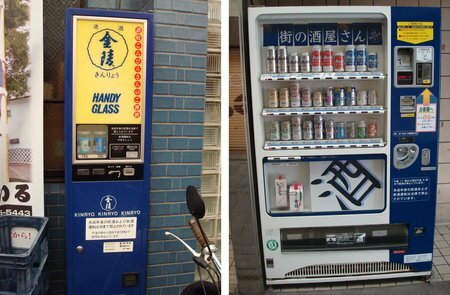 On the right is a vending machine that dispenses beer. And on the left is one that dispenses a glass – just in case you don’t want to drink straight from the can! 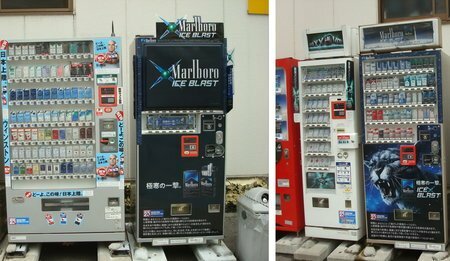 Here are some cigarette vending machines. 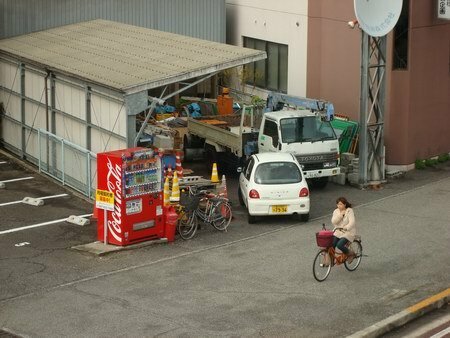 This is a photo of a vending machine taken from above, on a bridge. Next to almost all vending machines you’ll find a bin for your used can or bottle. Here is a slim line machine, which fits next to the shop window. If the restaurant runs of our drinks – no problem you can get one from the machine just outside the door. 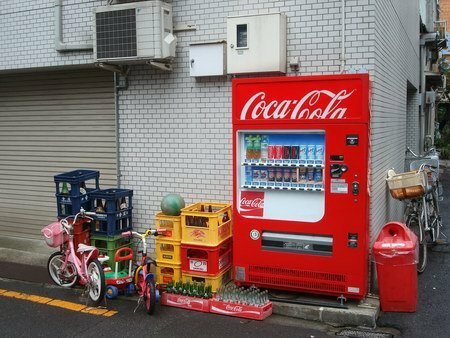 And here is the final one, a classic red Coca Cola vending machine in Japan. 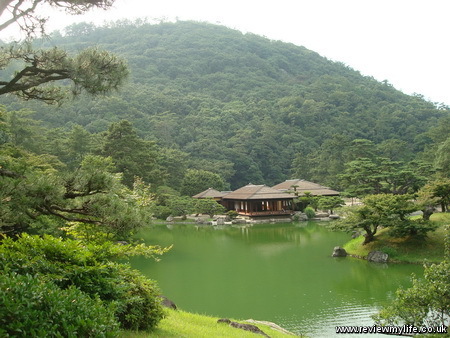 Shikoku-Mura 四国村 is an open air museum / art village situated at the base of Yashima Mountain in Takamatsu. Thirty three traditional buildings from all over Shikoku Island Japan have been reconstructed here. Shikoku-Mura is a 6-7 minute walk from the Kotoden Yashima station which can be reached via Takamatsu’s centrally located Kawaramachi station. The first installations you’ll see when you enter (¥800 for adults, free/¥300/¥400/¥500 for children depending on age) are the water wheel and the the vine bridge. You can walk across the vine bridge but you’ll have to be careful – there are some big gaps between the planks of wood. If you don’t fancy walking over it you can take the parallel pathway. On the left below is the Shodoshima Farmers’ Kabuki Theatre. As well as admiring the traditional buildings from the outside, most of them can be viewed from the inside too. Following the path for the first half of the open air village is all uphill, so you might need to take a few breaks if it is a hot summer’s day. Right near the top is a lighthouse from Okunoshima, and three different lighthouse keepers’ houses from around Shikoku. You can get a good view of parts of Takamatsu from the top. In one of the houses is a very nice resting area where you can get iced Japanese tea, and ice cream whilst sitting on tatami mats. 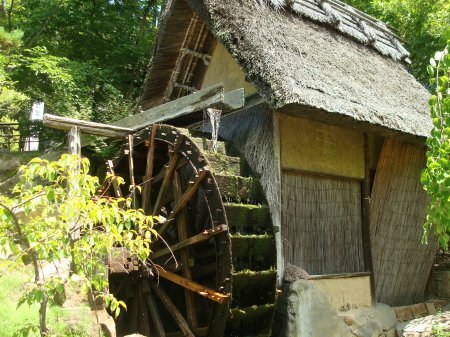 There are many water features around the village, including waterfalls, a waterwheel and a rice milling machine powered by water. The way down from the top is much easier than the way up, just try not to get bitten by insects – you are surrounded by trees and water so you need to be careful. 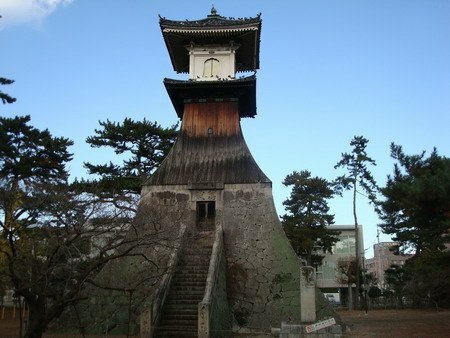 I can highly recommend Shikoku-Mura for a good half a day of sightseeing. If you are looking to fill the other half of the day without going far there is an aquarium and temple on the top of the mountain (you can get a bus to the top), and there is a shrine next to Shikoku-Mura as well. 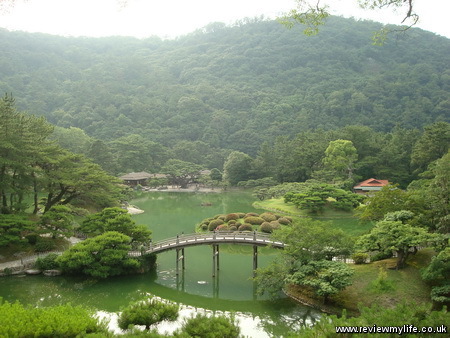 Ritsurin Park 栗林公園 is one of Takamatsu’s top tourist attraction, and is also one of the best and most beautiful gardens in Japan. It is situated to the South West of Takamatsu’s main centre, and is easily reachable by the Kotoden tram, bike, or walking. Walking from Kawaramachi will take less than 30 minutes. 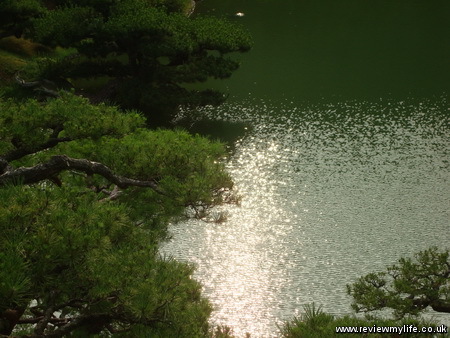 Ritsurin Park has 6 ponds and 13 hills. 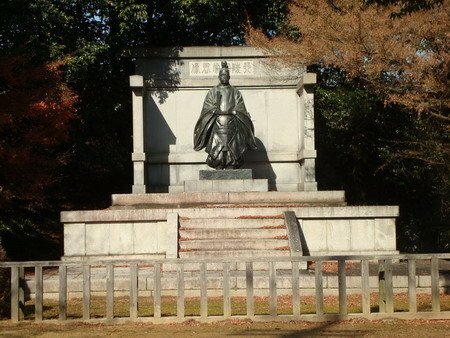 The park is next to Mt. 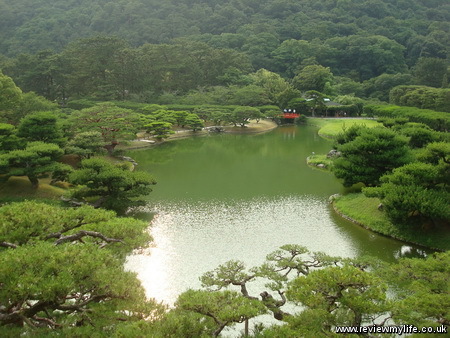 Shiun which provides an impressive backdrop to the gardens. Standard admission is ¥400, but admission is free on January 1st and March 16th (the park’s anniversary). You get given a map with two suggested overlapping routes around the park. There is a red route, and a blue route which each take about an hour. 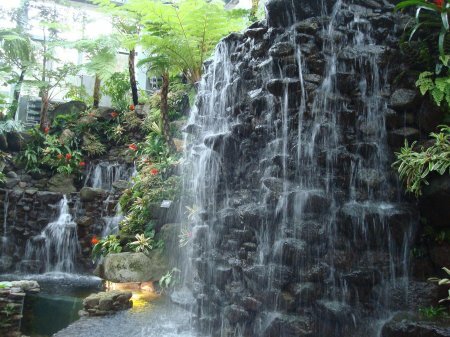 The gardens are full of trees, plants and flowers, ponds and waterfalls. 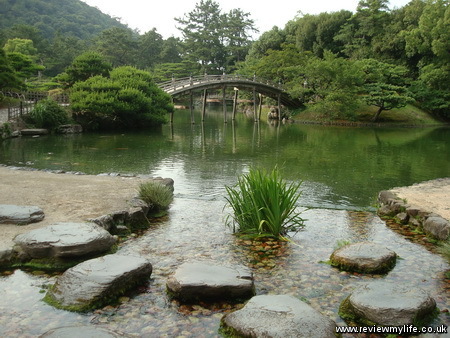 You’ll also find a craft museum, a tea house, and some koi ponds. As well as the koi you might spot turtles, birds and dragonflies if it is the right time of year. You might be wise to spray yourself with insect spray before visiting to keep mosquitoes at bay. You can do a quick tour of the park in one hour, but to do it justice you need at least three. If you want to stop for tea at the tea house and see the museum you should allow three hours. As well as the photos on this page I have another two pages of photos. Links are near the bottom of the post. Below is the tea room where you can have standard green tea, or the more traditional powdered variety. 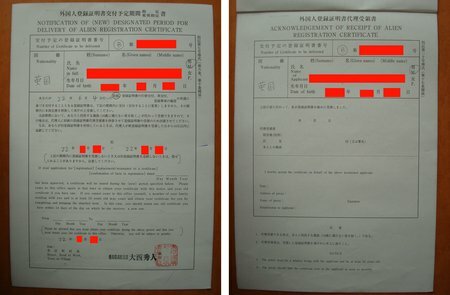 Anyone who stays in Japan for more than 90 days must register as an alien with the local government within 90 days of arriving in the country. When I arrived at Osaka Kansai airport on a Japanese working holiday visa I was reminded of the need to register by being given a leaflet about the alien registration process by the man on the immigration counter. A few weeks later I went to my local government office in Takamatsu 高松 with my passport and two passport sized photos. In Takamatsu the counter for alien registration is number 0. I took a ticket and waited my turn – it only took a minute before I was seen. Unfortunately the man on the counter spoke no English, but fortunately I had brought along my friend who spoke some Japanese. 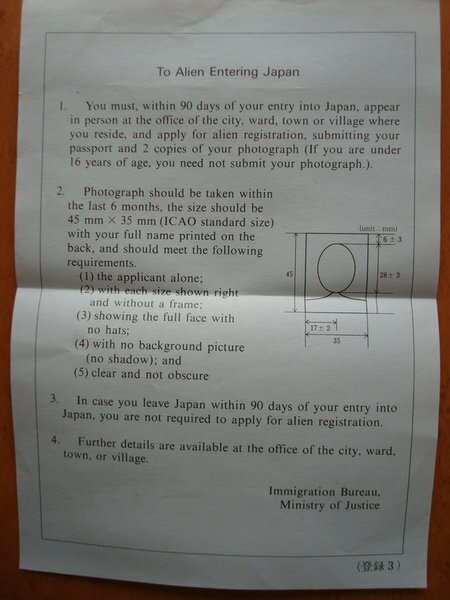 The man went thought the Japan alien registration form with us (you can see and example here. He wanted some parts to be filled in very precisely. Name – This was in the format Surname, First name, Middle name. And in that format too on the back of the passport photos. Name of head of the household – I had to put my own name, even though the flat I was staying in isn’t mine. Relationship with head of household – I had to write ‘Myself’. Occupation – I can’t remember what I put here. I’m not working in Japan, so I think this one was left blank. Most of the other fields are fairly self explanatory. After doing a bit of photocopying and other paperwork I was given back my passport with a new stamp in it. I was also given a form giving me the dates of when I could collect my alien registration card. This was to be in about two and a half weeks time. If you need to prove your registration before getting the card (to open a Japanese post office bank account for example) you can pay extra to get a proof of registration certificate, but this does cost extra. Going through the alien registration process needed quite a bit of assistance from the Japanese speaking man so it was good that I took someone with me. If you register in a big city like Tokyo or Osaka there will be a higher chance of finding English speakers in the office. If you need help with translation the registration office might be able to tell you how to get a translator. In Takamatsu you can arrange to have a free translator from the iPal International Exchange Centre accompany you. Collecting the alien registration card was extremely simple. I just had to go back to the same counter and hand back the dated form that I had been given when I registered. The man got my card out of a cupboard, and gave it to me, along with a small leaflet with some extra information on what to do if I need to change any information, lose the card, or leave the country. If you move or if any of the other details on your alien registration card change (e.g. getting a new visa / change of status), you will need to get your alien registration card updated within 14 days. You can do this at a local government office by filling in a form and handing in your card. They can usually process the application and update your card in about 20 minutes. They write the updates in the space on the back of the card. Kochi 高知 is a city on the South Side of Shikoku Island in Japan. You can reach it by bus from Takamatsu 高松. I travelled there and back using two single tickets – each costing ¥2900 (there was some deal at the time where two single tickets were cheaper than a return). The bus takes just over two hours from Takamatsu’s main bus station, and takes you to Kochi’s main bus station. At the Kochi bus station is a very good tourist information centre. One of the ladies there spoke very good English and was able to tell us how to get to all the places that we wanted to visit. They had some good English maps we could have for free. Unlimited travel on the My Yu bus – however note that the buses aren’t very frequent. Only 5 per day on weekdays, and 7 per day at the weekends. One single journey on one of the scheduled buses between Harimaya-bashi and Katsurahame. This extra bus journey helps to compensate for the small number of My Yu buses. Unlimited travel on the Kochi tram. This is what the ticket looked like. 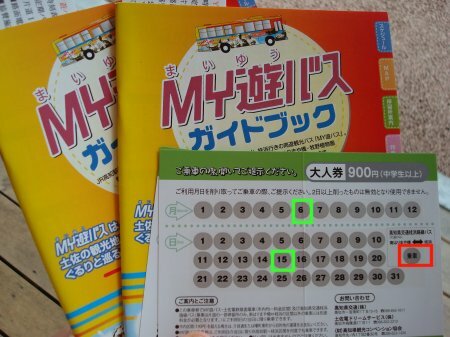 You scratch out the month and the day of when you are using the ticket (highlighted in green). The box highlighted in red is for the bus driver of the scheduled bus to scratch out when you use that bus. If you are going to Katsurahama Beach, and using the tram a bit then it will work out cheaper than buying each journey individually. 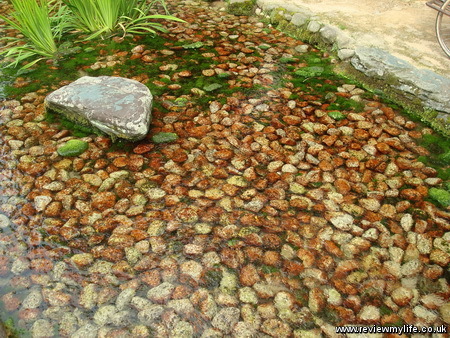 And if you go somewhere like the Makino Botanical Gardens as well, then you are in the money! To go to Katsurahama Beach to see the Pacific Ocean and the other sites there we took the scheduled bus from the specific bus stop that we could use. You are best off getting the tourist information people to give you a map with the bus stop location, and the bus times, so you get the right bus. 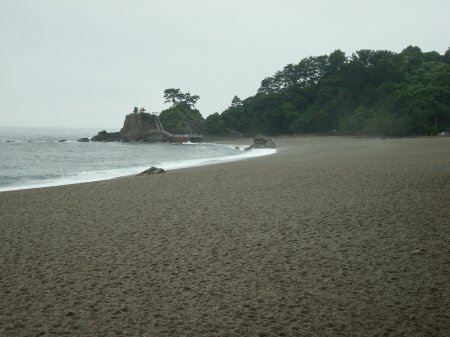 Once at the beach you can see the statue of Sakamoto Ryoma and walk along the beach, and up a small hill to see a little shrine and get a good view of the Pacific. 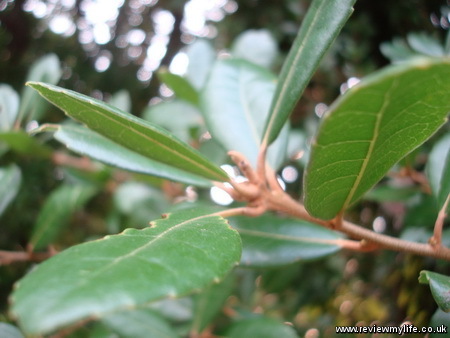 If you have time then go to the Makino Botanical Garden. 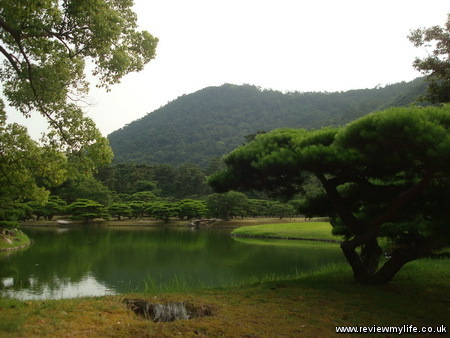 You can get the My Yu bus from Katsurahama Beach to the botanical gardens. Your My Yu bus ticket will get you a small discount off the admission price too. For us it was ¥600 each. Even though it was raining the botanical gardens was very impressive. It is located on a hill which gives it an interesting layout. There are two indoor museum areas, and a long covered walkway connecting them. In particular I recommend you visit the large green house which has loads of plants and flowers in a very attractive setting. We ate at two restaurants where we were able to get vegetarian food. We had an Indian meal at Masala, and a DIY vegetarian okonomiyaki at the Hakobe restaurant. There are within about 50m of each other. Ordering from the Indian is straightforward, but you’ll only be able to get vegetarian okonomiyaki ingredients if you speak enough Japanese to explain what you want (and don’t want) to the waiter. Kochi at night is pleasant to walk around. The city is compact, and the covered shopping areas are good landmarks for finding your bearings. We saw that Harimaya-bashi red bridge. It is very small and not very impressive but worth a photo. We stayed at the Los Inn Hotel. It is about five minutes walk from the station. The room we had was very cheap and functional. Not a luxury place to stay, but fine if you are here for a short stay. 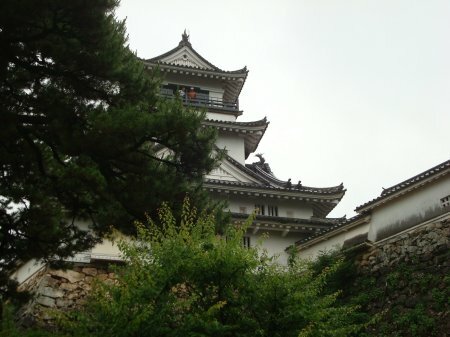 Kochi Castle is located on a hill on the West side of the city centre. You can walk around the grounds for free and climb up to see the castle itself. Many of the information plaques have descriptions in English so you can discover the history of the castle as you explore. And finally here is a map of the places we visited.